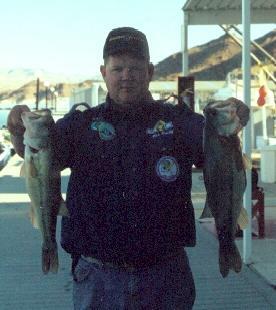 The Las Vegas Bass Club Angler of the Year for 2002 on the boater side is Mick Ratcliff who ended the season with 333 points and 79.58 total pounds including the seasons big fish at 5.74 pounds. He had back to back wins in February and March and again in June and July for a total of 4 wins on the season. He also finished second twice and third once this season. Mick ,age 39, started his bass fishing journey in the spring of 1996 in Tallahassee Florida when a friend bought a boat cause it was a good deal. "After the boat sat around for a year I called him up and told him we needed to see if it would float. I talked to another friend who was a fisherman and asked him what I need to do to catch fish on one of the local lakes, he told me, we went out, and we got skunked. The next time out though, I caught six nice bass and decided I liked this stuff. I had my own boat two months later and joined Big Bend Bass club there in Tallahassee a few months after that." In 2000 Mick decided he needed to be closer to his family in Idaho so he found a job in Las Vegas. "The first thing I did when I got off the plane for the job interview was rent a car and go look at the lake" He also found a tackle shop or two, talked to some folks and found out that Las Vegas did indeed have a pretty decent bass fishing scene and that the Las Vegas Bass Club was the one to join. He joined the club for the 2001 season finishing third on the year and "learning a ton" about western fishing. Mick's go to bait in local waters is a jig. "I don't really like crankin and I don't like using texas rigged worms in deep water. I really have a lot of confidence that when I pick up a jig I'm gonna get bit." He is currently trying to master, or at least become competent with "that darn upside down Carolina rig," a drop shot. He also has a bunch of confidence in his spinner bait box. "I had a win, a third and a fourth this year on spinnerbaits. I love them on Mohave." As far as favorite bodies of water Mick likes lake Eufaula on the Georgia/ Alabama border. He also likes lake Mead. "Mead is by far the best numbers lake I have ever been on. When you can go out in May and June and catch 20 fish apiece or better every time you go out, it just don't get any better. If only they had a few more pounds to them it would be one of the best lakes in the country." He also likes Lake Mohave cause it's got better quality fish and Lake Havasu cause "They got grass!!" As for career highlights, "Angler of the Year in the Las Vegas Bass Club is definitely one of them. There are some good sticks in this club and it is an honor to take home the title". Another highlight was his 5th place finish in the Florida B.A.S.S. Federation state tournament in 1999 which got him a place on the Florida Federation State Team for 2000. " We fished the divisional on Lake Eufaula and I had a decent tournament. I lead the Florida team after the first day but had a couple tough days to follow but at least I had a shot at it". Mick hopes for bigger and better things in the future. "I am planning on fishing a pro trail this year and see where it takes me. I would eventually like to fish B.A.S.S. or FLW but it is gonna be a little tricky doing it from the west unless things change. I want to be a pro fisherman when I grow up." His advise for others interested in tournament fishing? "Three things...... 1. Have fun! 2. Spend as much time on the water as you can. You should learn something every time you go out. 3. Have fun...your fishing... how could you not have fun!" He also points out that the quickest way to learn about bass fishing is to join a club and participate in their tournaments. And finally....Mick would like to thank some folks. Mike Roser at Mike Roser Lures for some of the best spinnerbaits on the market. Jim and Nicole at Black Jack Custom Baits for a great jig and everything else they've done to help me over the last couple years. All the rest of the club sponsors without whom we couldn't do what we do. "All my partners this year and all the guys that brought their boats out and participated. Thanks! It's been fun!!"